And the show does have its own midwest influence. A little investigation reveals that one of the producers, Bob Heath, is an Akron native. Heath told The Plain Dealer that the show's intention was to poke fun at the youth- and looks-obsessed denizens of L.A. and point out the down-to-earth qualities of Clevelanders (and the midwest in general). Early clips are promising and the pedigree is excellent (creators Sean Will & Grace Hayes and Suzanne Frasier Martin). 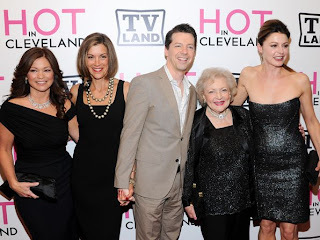 Take a peek at Hot in Cleveland and see what you think. The premise does remind us a little bit of the 30 Rock episode “Cleveland.” That’s the one where Liz Lemon follows her boyfriend, Floyd, back home to “the Cleve” and discovers how wonderful it is.